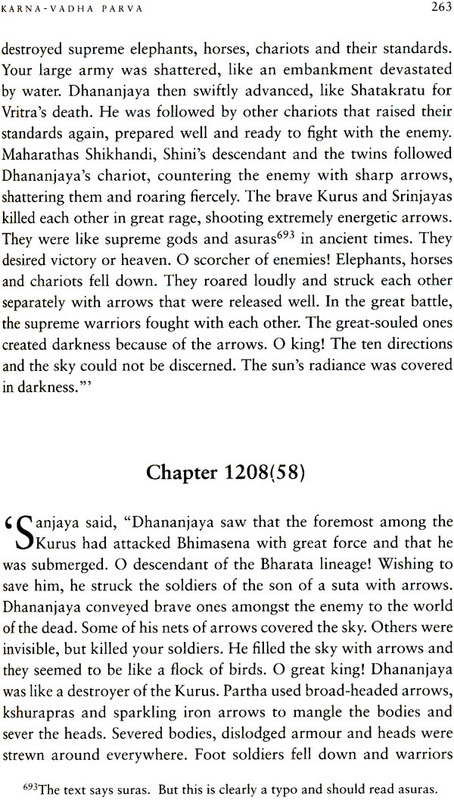 The Mahabharata is one of the Greatest stories ever told. Thought the basic plot is Widely Known, there is much more to the epic then the dispute between the Kouravas and Pandavas that led to the battle in Kuruksshetra. It has innumerable sub plot that accommodate fascinating and digressions, and it has rarely been translated in full, given its formidable length of 80.000 shlokas or couples. 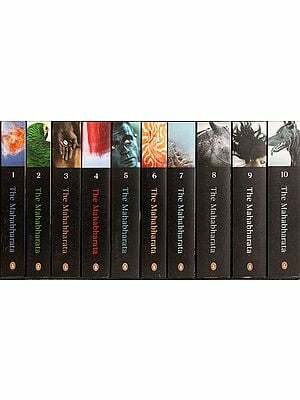 This magnificent 10-volume unabridged translations of the epic is based on the Critical Edition compiled at the Bhandarkar Oriental Research Institute. The seven volume continues with the account of the war with Karna who is instated as the commander of the Kourava army for Two days After his death Shalya is the Commander for one day Shalya too dies Duryodhana meets his death at the hands of Bhima and the great war cames to an end. The Hindu tradition has an amazingly large corpus of religious texts spanning Vedas, Vedanta (Brabmans, aranyakas, Upanishads, ) Vedangas, smritis, Puranas , dharmashastras and itihasa. For most of these texts, especially if one excludes classical Sanskrit literature, we don’t quite know when they were composed and by whom, not that one is looking for single author. Some of the minor Puranas (Upa Purana) are of later vintage. For instance, the Bhavishya Purana (which is often listed as a major Purana or Maha Purana) mentions Queen Victoria. In the listing of the corpus above figure itihasa, translated into English as history doesn’t entirely capture the nuance of itihasa, which is better translated a this is indeed what happened Itihasa isn’t myth or fiction, it is a chronicle of what happened it is fact. Or so runs the belief. And itihasa consists of India’s two major epics, the Ramayana and the Mahabharata. The former is believed to correct. The Ramayana has segments in prose and the Mahabharata has segments in poetry Itihasa doesn’t quite belong to the category of religious texts in a way that the Vedas and Vedanta are religious However the dividing line between what is religious and what is not is fuzzy. After all itihasa is also about attaining the adjectives of dharma artha, kama and the Mahabharata includes Hinduism most important spiritual text-the Bhagavad Gita.. The epics are not part of the Shruti tradition. That tradition is like revelation, without any were composer, The epic are part of the Smriti tradition. At the time they were composed, there was no question texts being written down. They were recited, heard memorized and passed down through the generations. But the Smriti tradition had composers. The Ramayana was composed by Valmiki, regarded as the first poet or kavi .The word kavi has a secondary meaning as poet or rhyme. The primary meaning of kavi is someone who is wise And In the sense. The compose of the Mahabharata was no less wise. This was Vedavyasa or Vyasadeva. He was no named because he classified (vyasa )the Vedas. Vedavyasa or Vyasadeva isn’t proper name It is title. Once in a while, in accordance with the needs of the era, The Vedas need to be classified. Each person obtains the title and there have been twenty eight Vyasadeva so far. At one level, the question about who composed the Mahabharata is pointless. According to popular belief and according to what the Mahabharata itself states. It was composed by Krishna Dvaipayana Vedavyasa (Vyadadeva ). But the text was not composed and cast in stone at a single point in time. Multiple authors kept adding layers and embellishing it. Sections just kept get ting added and it is no one’s suggestion that Krishna Dvaipayana Vedavyasa composed the text of the Mahabharata as it stand today. Consequently , the Mahabharata is for more unstructured then the Ramayana. The major sections of the Ramayana are know as kandas and one meaning of the word kanda is the stem or trunk of a tree, Suggesting solidity. The major section of the Mahabharata are Know as parvas and while one meaning of the word parva is limb or member or joint, in its nuance there is greater fluidity in the word parva than in kanda. The Vyasadeva we are concerned with had a proper name of Krishna Dvaipayana. He was born on an island (Dvipa). That explain the Dvaipayana part of the name, He was dark. That explain the Krishna part of the name. ( It wasn’t only the incarnation of Vishnu who had the name of Krishna.) Krishna Dvaipayana Vedavyasa was also related to the protagonists of the Mahabharata story. To go back to the origins, the Ramayana is about the solar dynasty, while the Mahabharata is about the lunar dynasty. As is to be expected the lunar dynasty begins with soma (the moon) and goes down through Pururava (who married the famous apsara Urvashi,(Nahusha and Yayati: Yayati become old, but wasn’t ready to give up the pleasures of life. He asked his sons to temporarily lone him their youth. All but one refused. The one who refused were cursed that they would never be kings and this includes the Yadavas (descended from yadu). The one who agreed was Puru’s son Duhshanta was made famous by kalidasa in the duhshanta shakuntala story and their son Bharata, contributing to the name of Bharatatavarsha. Bharata grandson was kuru. We often tend to think of the kouravas as the evil protagonists in the Mahabharata story and the Pandavas as the good protagonists. Since Kuru was a commeon ancestor, the Appellation Kourava applies equally to Yudhhishthira and his brother and Duryodhana and his brother Kuru’s Grandson was Santanu . Through Satyavati, Shantanu fathered hitrangada and Vichiteraviya. However, the sage Parashara and Shantanu had already fathered Krishna Avaipayana through Ganga. 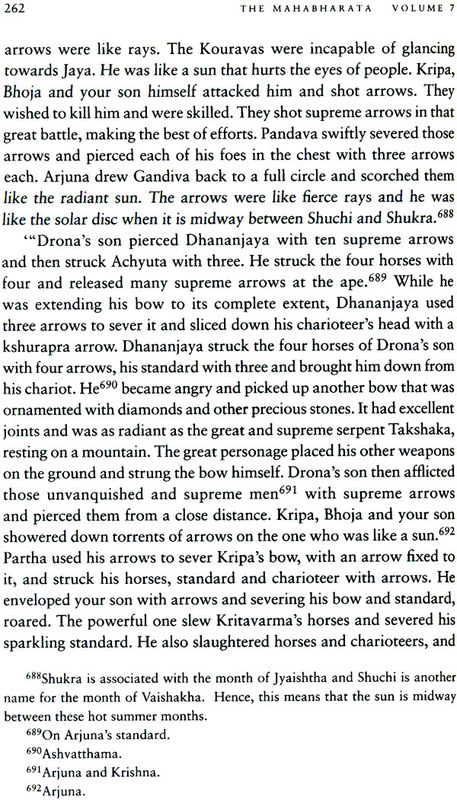 Dvaipayana through Satyavati and Shantanu had already Father Bhishma through Ganga. Dhritarasthra and Pandu were fathered o Vichitravirya’s wives by Krishna Dvaipayana. The story of the epic is also about these antecedents and consequents. The core Mahabharata story is known to every Indian and is normally understood as a dispute between the Kouravas (descended from Dhritarashtra) and the Pandavas ( descended from Pandu). However, this is a distilled version, which really begins with Shantanu. The non-distilled version takes us to the roots of the genealogical tree and at several points along this tree we confront a problem with impotence/sterlity/death, resulting in offspring through a surrogate father. Such sons were accepted in that day and age. Nor was this lunar dynasty problems alone. In the Ramayana, Dashratha of the solar dynasty also had an infertility problem, corrected through a sacrifice. To return to the genealogical tre, the Pandavas won a the Kurukshetra war. However, their five sons through Droupadi were killed. So was Bhima's son Ghatokkacha, fathered on Hidimba. As was Arjuna's son Abhimanyu, fathered on Subhadra. Abhimanyu's son Parikshit inherited the throne in Hastinapura, but was killed by a serpent, Parikshit's son was Janamejaya. Krishna Dvaipayanas’s power of composition were remarkable. Having classified the Vedas he composed the Mahabharata in 100,000 shokas or couplets, today’s Mahabharata text doesn’t have that many shokas, even if the Hari Vamsha (regarded as the epilogue to the Mahabharata )is included. One reaches around 90,000 shlokas . that too is gigantic number . (The Mahabharata is almost four time the size of the Ramayana and is longer then any other epic anywhere in the world . )For a account of 9,’000 Sanskrit Scholar we are talking about something in the neighborhood of two million world . The next of the Mahabharata tell us that Krishna Dvaipayana Finished this composition in three years. This doesn’t necessarily mean that the composed 900,000 Scholar . the text also tell us that there are three version to the to the Mahabharata. The original version was called Jaya and had 8.800 shlokas. This was expanded to 24,000 for 100,000) scholar and called Mahabharata.